Vitamin A is a fat-soluble vitamin that is critical for maintaining overall good health. It is present in two forms in nature- Retinol and Beta-carotene. Retinol is the active form of Vitamin A which can be used directly by the body. Beta-carotene is obtained from colorful fruits and vegetables and is converted to retinol in the body for further use. Vitamin A is essential for eyes, skin, bones and gastrointestinal health. 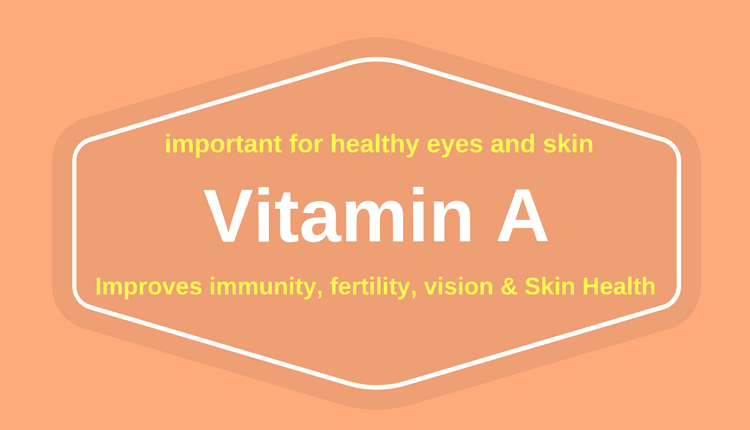 Vitamin A is an amazing fat-soluble vitamin which is essential for eyes and vision. Getting enough Vitamin A reduces the risk of developing age-related macular degeneration, cataract, dry eyes and night blindness. It soothes inflammation of the eyes and keeps eye infections at bay. Beta-carotene possesses antioxidant functions and anti-inflammatory properties that ameliorate the risk of eye diseases. Moreover, Vitamin A is required to nourish cornea and to protect it against damage. Your eyes need Vitamin A to produce moisture and to keep them lubricated. Foods rich in Vitamin A are packed with age-fighting power that enhance skin health and delays the onset of premature skin aging. It improves wrinkles and reduces brown spots associated with aging and enhances the formation of skin-building compounds. Vitamin A decreases degradation of collagen, a skin protein that holds the skin together and makes the skin look young. Besides this, Vitamin A retains water, keeps the skin moisturized and is effective for the treatment of dry and dull skin which is otherwise common during aging. The onset of infectious disease is high in populations where the intake of Vitamin A rich foods is low. Insufficiency of Vitamin A impairs immunity and thus, the chances of acquiring infections increases. In the absence of this vitamin, the function of immune cells is diminished, and the normal regeneration of protective barrier is impeded. Therefore, such a Vitamin A deficient individual becomes more prone to infections because of poor immunity. Vitamin A inhibits the growth and development of certain types of cancer tumors, which include lung, liver, oral, skin, breast and bladder cancer. It slows down the progression of the disease, prevents its spread and relapse. Studies have revealed that low level of Vitamin A in the body plays a crucial role in the development and aggravation of acne. Getting enough Vitamin A from yellow-orange fruits and vegetables help in the regeneration of damaged skin cells and prevent dead skin cells from shedding off. Vitamin A intake boosts good reproductive health. It supports embryonic development as well as male and female reproduction. Vitamin A helps in the maturation of follicles that in turn, promote development of the egg. Whereas if the egg is under-developed it will not be fertilized. Scientific studies have observed that treatment with Vitamin A reduces watery diarrhea and death due to diarrhea in children. It decreases the duration as well as severity of diarrhea. It has been found that Vitamin A is effective in the treatment of respiratory infections and measles in children. It promotes muscle growth and tissue repair. Vitamin A prevents the formation of kidney stones and boosts overall bone health. Getting Vitamin A from natural food sources is beneficial for overall health, but taking it in excess amounts in the form of supplements and injections can have certain negative effects on the body such as nausea, bone pain, dizziness, poor appetite, dry and rough skin.